With the rising awareness of the dangers of gluten, many health-conscious people are making the shift to a gluten free diet plan, or at least heavily-reducing their gluten intake. Many of you bold enough to make this commitment, and those that have little choice in the matter, may be unsure whether or not certain foods are gluten free. Some foods are more obvious to suspect, such as wheat, pastas, or many flours—while others such as Emulsifiers, Bouillon Cubes, and certain candies may also contain the inflammatory protein. Our focus today is the question “is oatmeal gluten free?” To those here for a quick answer—your oatmeal might contain gluten so be careful to buy trustworthy brands that you know are Gluten Free like the Gluten Free Old Fashioned Rolled Oats from Bob’s Red Mill. Gluten is most typically a composite of many related protein structures found in wheat and other related grains such as barley and rye. Gluten is the product of two major storage proteins called gliadin and glutenin, and can be used in food applications to enrich low-protein foods for nutritional purposes as well as an emulsifier to hold ingredients together. This elastically-fantastic attribute is seen exemplified in the tossing of pizza dough. Gluten contains many individual proteins, but is regarded as being predominantly low in nutritional value compared to other foods qualified for a gluten free diet plan. Sounds Pretty Scary to me—but then again what happens when people without celiac disease or non-celiac gluten sensitivities eat gluten-containing foods? For people without gluten-sensitivity, grains and other foods containing the substance are broken down normally during the digestive process. Upon entering your intestines, an enzyme called transglutaminase breaks Gluten down into its fundamental building blocks— gliaden and glutenin. These proteins are then absorbed normally through the lining of the intestines and used by your body, and everyone goes home happy. For people with a gluten free diet plan due to a Gluten sensitivity or celiac disease, their bodies don’t recognize gliaden and glutenin as being nutritional components suitable for use. Once these compounds are discovered by the body, they are attacked by the immune system as if they were a harmful bacteria or virus. In celiac patients, these attacking cells actually go after the transglutaminase itself, causing damage to the intestinal lining through constant immuno-inflammatory conditions. This inflammation, over time, causes the gut lining to erode and whither, which in turn lowers the body’s ability to fight off other harmful substances. More inflammation equals more damage. More damage equals more inflammation. It’s a very vicious cycle to get caught up in and can snowball into a serious uphill battle before most people realize what’s going on. Gluten sensitivity and Celiac Disease have both gained tremendous media attention in the recent years, prompting a surge in consumer demand for gluten-Free products. Anyone having received a nasty scowl after turning down a friend’s secret biscuit recipe has probably found themselves wonder if Gluten is so bad, why are we just now hearing about it? Leaky Gut, Intestinal Permeability, G.A.P.S; there are many pseudonyms for an alarmingly systemic condition in which unwanted substances such as food particles are able to make their way through the intestinal lining into the blood stream. Still regarded by Wikipedia as being a non-recognized medical diagnosis, leaky gut syndrome is a serious medical condition that is thought to affect millions of people yearly, but really throughout their entire lives. By allowing non-digested or partially digested food particles into the bloodstream, a permeated gut-lining can expose your immune system to an onslaught of reactionary compounds. These unwanted intruders are thought to potentially affect every single system within the body through constant immuno-responses, creating inflammation and causing permanent tissue damage. In addition to inflammation and autoimmune reactions, many mental disorders such as depression and even schizophrenia are now regarded as having potential roots in the digestive system. Certain molecules exist in potentially-harmful and psychoaffective states during the process of normal digestion, and can cause any numbers of issues should they be allowed in the bloodstream before complete enzymatic breakdown. Gliaden for example, a component of Gluten, exists in the form of Gliadorphin while being broken down by the body’s natural digestion process. Should such an opioid peptide be allowed into the bloodstream, many unwanted mental and physical symptoms could manifest. Theories of mental disease being rooted in gut health are largely seated in such arguments. While such a concept may seem abstract to some, it can also be thought of simply in the lateral comparison to other familiar external compounds. Clorox will kill you if you drink it, why couldn’t exposure to certain grains cause your allergies? Use that mental footwork. Long ago in a land 50 years in our past, gluten-related health disorders were recored as being 1 in 650. Today they are as high as 1 in 120! Sure, diagnosis procedures have evolved and are capable of identifying cases with higher precision, and with the world wide web more people are aware of the symptoms enough to ask for genetic testing. This most-surely accounts for some of the rise, but doubtfully-so; the majority of prevalent increases. While writing for the Huffington Post, Dr. Amy Myers M.D. discusses many of the changes that modern wheats and grains have undergone changing them from the weather-sensitive low-protein rarities of our ancestors, to the new ultra-drought-resistant super grains we know and beware ourselves of today. Hybridizations in food-centric grain offerings allow for the exposure to many forms of proteins that didn’t exist in historical wheat species, as well as pesticides that are just unnatural, and other bizarrely non- terragenic forms of wheat and grains that have been processed to have accompanying molecules removed. Sliding right into the GMO vs. Non-GMO argument, such foods present our bodies with tasks they have had little evolutionary practice with, which wouldn’t cause surprise in dire results. With a little background under your belt, now you will be able to fully understand the answer to this question. As with many questions; the answer isn’t really a “yes” or “no.” In reality, it depends on what brand of oatmeal you’re buying, what types of oats are listed on the ingredients, and how they are processed. Avena Sativa, or Oatmeal as most of us know it, is a cereal grain that is grown for its seed—kind of disqualifying it from being referred to as a grain. The Oat seed is often rolled by a press-type machine to produce the flat oval-ish delight we all grew up eating. Steel-cut oats are the same stuff, just mechanically-processed in a different manner. Naturally, this food is Gluten free, but in many production facilities it can be processed alongside other foods that do contain Gluten. Another pitfall to watch out for is flavored oatmeal products which have Gluten containing ingredients added. FALCPA’s labeling requirements do not apply to the potential or unintentional presence of major food allergens in foods resulting from “cross-contact” situations during manufacturing, e.g., because of shared equipment or processing lines. In the context of food allergens, “cross-contact” occurs when a residue or trace amount of an allergenic food becomes incorporated into another food not intended to contain it. FDA guidance for the food industry states that food allergen advisory statements, e.g., “may contain [allergen]” or “produced in a facility that also uses [allergen]” should not be used as a substitute for adhering to current good manufacturing practices and must be truthful and not misleading. The language provides describes the sentiment of the FDA regarding what lengths manufacturers need to cover their own asses, but doesn’t state many explicit regulatory specifics to protect the consumer. So oatmeal on its own doesn’t contain Gluten, but certain brands may sell mixed varieties, or certain types of flavored Oatmeal blends that do contain Gluten. 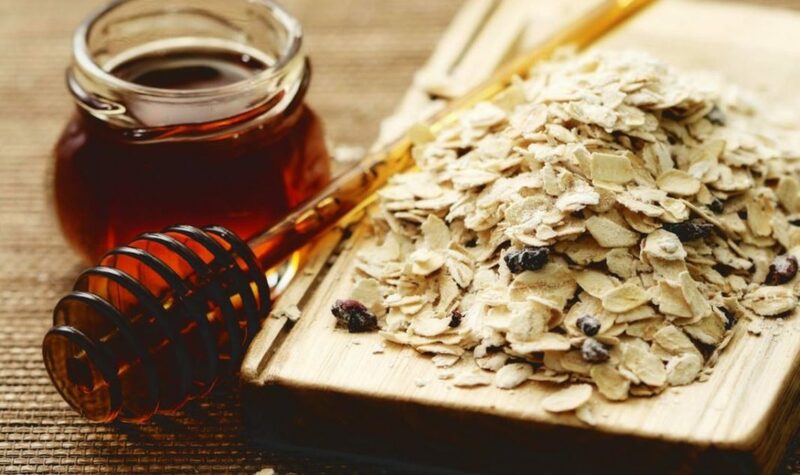 Products that list only Oatmeal on their ingredients list may be produced on equipment that has also been used to process Gluten-containing foods, and may be contaminated. The FDA requires manufacturers to list all the ingredients, as well as provide advisory statements related to processing practices that may allow Gluten to contaminate Gluten-Free foods. If you are considering adding oatmeal to your gluten free diet plan, make sure you carefully check which brand and flavor you are purchasing. Your best bet to avoid the pitfalls of accidental Gluten exposure is to shop a trusted brand that clearly states their product as being Gluten Free. If you follow this practice, you’ll more-than-likely be safe. Brands such as Bob’s Red Mill offer a wide-variety of conscientiously-produced grains and foods that are separated carefully during manufacturing. The Gluten Free Whole Rolled Oats offered by Bob’s Red Mill even comes with a reassuring Gluten Free banner, which occupies a large portion of the label. Hopefully you’ve learned a little regarding Gluten, the history of wheat hybridization, the potential impact leaky gut syndrome has on systemic health and—the reason you likely came in there first place—the way to determine if the Oatmeal you’re side-balling right now has Gluten in it. Oatmeal is a naturally gluten-freed food, however the methods by which is is processed often leads it tainted with gluten, and probably other unwanted particles as well. If you are just trying to avoid gluten, this probably won't be an issue for you. If, however, you are very sensitive to gluten/gliaden, you should make sure to purchase oatmeal products clearly marked as being Gluten Free, such as The Old Fashion Rolled Oats from Bob's Red Mill.